Tempie Hampton, who has lived in Woodlawn for 50 years, says the Family Dolllar store in the 6300 block of South Cottage Grove is convenient. In a recent ranking of the top 100 U.S. retailers, Family Dollar wasn’t close to cracking the top 10. But you will find plenty of the discount stores in many of Chicago’s black or low-income neighborhoods where crème of the crop retailers won’t go. Scott Mushkin, managing director at Wolfe Research, based in New York, has observed Family Dollar stores across the country in his 15 years researching the retail industry. Roy Nelson, who lives in the South Side community of Woodlawn, isn’t poor. He is middle class. On a recent morning, Nelson was leaving a Family Dollar store at 6359 S. Cottage Grove Ave. with about $9 of merchandise, including toothpaste, mouthwash and coffee. The retired operations manager at O’Hare International Airport has lived in Woodlawn since 1957. In the absence of a store like Target, and without a Jewel or Mariano’s, Nelson said community residents rely on the Family Dollar and a nearby Aldi grocery store, which is also on Cottage Grove, one of Woodlawn’s key commercial corridors. The trials he describes are a snapshot of the daily economic reality in black communities across the city and country. Even for the black middle class. Census data shows that affluent black and Latino households live in closer proximity to poor people compared to well-to-do white households. Studies also show that companies often underestimate the buying power of low-income households. Experts say areas like Woodlawn can support more retail despite being labeled poor. And so does Nelson. Family Dollar isn’t the only national retail chain that’s very visible in high-poverty neighborhoods. Walgreens, CVS and Dunkin’ Donuts also operate in the communities, as does Wal-Mart, which is fairly new to the market, said Kim Zeuli, senior vice president of the Initiative for a Competitive Inner City, a Boston-based think tank. Family Dollar generated $10.5 billion in sales last fiscal year from more than 8,000 stores in 46 states. 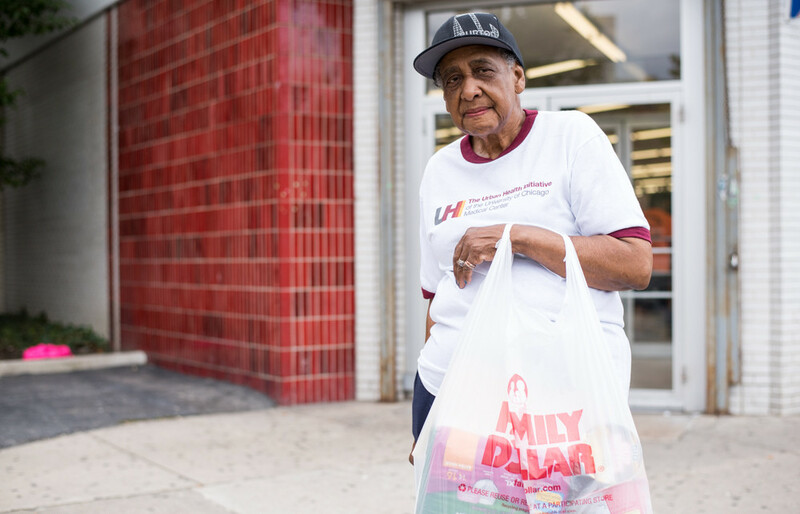 More than 80 stores in Chicago operate under the Family Dollar banner. In a statement, a company spokeswoman said the discount store aims to open shop where there aren’t other retail options. Because Family Dollar often targets underserved areas, it has a big footprint in urban communities of color. In large markets like Chicago, the spokeswoman said in an email, Family Dollar locates where customers without cars can walk, bike or take public transit to its stores. 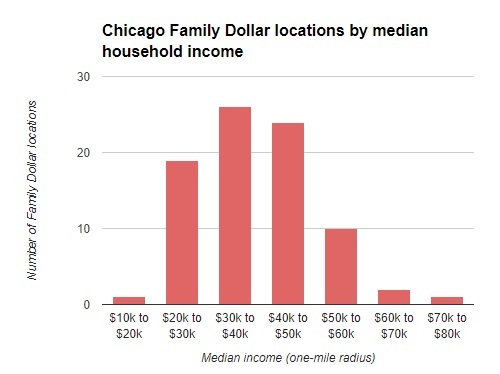 A Chicago Reporter analysis of the city’s Family Dollar locations found that the stores operate in pockets where there is a high concentration of low-income people. Seventy out of 83 Family Dollar stores in the city are located where the average annual income of households within a one-mile radius is less than $50,000 a year. You won’t find the stores in the Loop, Lincoln Park or Lakeview, but you’ll find them abundant in West and South Side communities like Austin, Chatham and Woodlawn. Nationwide, about 68 percent of Family Dollar shoppers have an annual income less than $50,000, compared to 54 percent of Wal-Mart shoppers and 38 percent of Target shoppers, according to Michael Paglia, director of retail insights at Kantar Retail. Though many shoppers prefer Family Dollar for prices comparable to and often cheaper than major discounters like Wal-Mart and Target, others deride it as “ghetto” or “hood,” two descriptions in Chicago Yelp reviews that swipe at the stores, the employees and the customers. Sources: Store websites; American Community Survey; Geocoding by Texas A&M University GeoServices. But the average Family Dollar store generates $1.3 million in annual revenue. And the company was one of the biggest dollar store chains in the U.S. before rival Dollar Tree acquired it recently for $9.2 billion. The deal created a company with nearly $20 billion in combined sales and more than 13,600 stores throughout the U.S. and Canada. Federal regulators pushed Dollar Tree to sell 330 Family Dollar stores, with a total of nearly $45.5 million in operating income, because they feared the merger would hurt competition in the discount retail sector. About 13 of the affected stores are in Chicago. Sycamore Partners, a private-equity firm, bought the stores and plans to operate them under its Dollar Express store banner. Not bad for a chain that serves the ‘hood. Tempie Hampton, 77, who has lived in Woodlawn for 50 years, walked out of the store recently with a bag full of soup cans. “There’s not much else in the area as of now,” said the retired nutritionist. Englewood resident Jamie Dordin headed into the store recently to buy about $20 worth of household items, she said. A frequent customer, she was puzzled by Family Dollar’s reputation among some people and praised the Woodlawn location. However, Dordin said if there was a Target or Wal-Mart store in place of the Family Dollar, she’d likely go there instead, so she could buy in bulk and shop for a broader variety of items. But even if there were more Targets or Wal-Marts in the community, there are shoppers who would prefer dollar stores for thrift — or necessity. Paglia said some low-income shoppers are so financially constrained that they might only be able to afford to spend $10 to buy essential everyday items. In that context, he said, “the sprawling assortment of a Wal-Mart or a Target has little appeal” to the poorest shoppers. Nelson considers himself a member of the middle class, a demographic he said that makes Woodlawn a stronger consumer market than some companies assume. Dominic Surya contributed to this report. Low-wage workers in Chicago will join a nationwide mobilization for a $15-an-hour living wage on Wednesday — just a week after Mayor Emanuel was re-elected, with his multiyear minimum-wage hike as a major campaign theme.